Albert van der Sel : The primitive integral. In the series: Note 8. Subject: Primitive functions or Integral functions. This note: Note 8: Primitive functions or Integral. Please be sure that you are on a "level" at least equivalent to the contents up to, and including, note 7. This note will be a very short note on Primitive fuctions, and "integrals". The "core" idea is really easy, as you will see in a minute. It's not to hard to explain an expression like ∫ab f(x) dx. of a "summation" of very small "elements", as you will see below. and "well behaved" function. 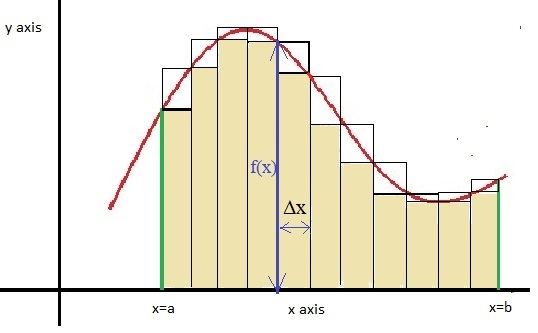 For example, there is no asymptotic behaviour for the "x interval"
for which we will study f(x). Let's study f(x) in the interval x ∈ [a,b], that is, x "runs" in the interval from "x=a" to "x=b". the area between f(x) and the x-axis. defined from "x=a" to "x=b" (green vertical lines). Those boundaries, and the curve, determine the "area"
between the curve and the x axis. Fig 1. The area defined by the boundaries x=a, x=b, and f(x). For a rectangle with sides "b" and "h", we now that the area ("A") can be calculated as A=bxc. For a function as shown above, it cannot be that easy. Well, actually it will be quite the same procedure. So suppose we divide the interval [a,b] into smal steps. Say that [a,b] is the range [1,9]. Then we could, for example, divide it in [1,2], [2,3], [3,4], [4,5], [5,6], [6,7], [7,8], [8,9]. is often used to denote a small interval, a sort of "delta" from a range of values. of rectangles. The width of such rectangle is Δxi, and in this case, this is "1". The height of such rectangle, then would be "f(Δxi). So, the area defined by such rectangle would be A = Δxi x f(Δxi). AApproximation of the Area between f(x) and the x-axis = Σ i=1i=8 Δ xi f(Δxi). Notice, that how smaller you would make such interval Δxi, the more accurate the sum would get. would get larger and larger. it would mean the summation k1 + k2 + .. + kn, where each ki would be some number. as in the equation above. It's thus simply another way to write it down. It's just another way to put it on paper. Note: if Δxi is really getting infinitesemally small, then it will be written as "dx". In such case, the summation would have an extremely large number of elements. (going to infinite). Remember from note 5 on derivatives, that a derivate function is also denoted by an accent " ' ". of f(x). Also, an expression using ∫ f(x) dx, is called an Integral. Now, I will show you how the area actually can be calculated, as is expressed in equation 3. A mathematician would probably look very disturbed when he/she looks at my argument below. Suppose we have the line f(x)=2x. Figure 2 below, illustrates the graph of y=2x. Fig 2. The area defined by the boundaries x=a, x=b, and f(x)=2x. 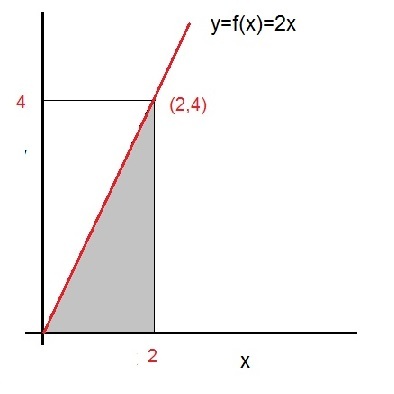 Thus: the area between f(x) and the x-axis where x runs from x=0 up to x=4, is "4". Now, let calculate the integral. It should return the value 4 as well. A key point is thus, to find F(x), if you only happen to know what f(x) is. 2. Primitive fuction: The indefinite integral ∫ f(x) dx. Below we use the simple assumption that f(x) is a "well-behaved" function, with no gaps, and no asymptotes in the "neighborhood". Remember the "derivative" function, we saw in note 5? Here we found for example, that suppose we have f(x)=x2 + b. Then the "derivative" function is f '(x)=2x. In note 5, we also discussed some methods to calculate the "derivative", for several types of functions. and therefore it determines the "slope", or gradient, of the tangent line to f(x), at "x". This time, it's a bit the otherway around. Suppose we have f(x). Then what is F(x), in such a way that F '(x)=f(x)? actually, "F(x)=x4 + c", where c is a constant. The derivative of a constant is zero. Suppose we have funcion f(x). Then what is F(x), in such a way that F '(x)=f(x)? Thus f(x) is the "derivative" function of F(x). So, F(x) is called the antiderivative, or primitive function of f(x). It's just a way to write down stuff. Thus, the primitive of 3x2, is ofcourse x3. You see how to interpret the "1/(k+1) xk+1" stuff? where a is some constant. Then what is the primitive function H(x)? Indeed, you may say that we need to add a constant "c" too. It's true since the derivative of "1/6 x6 + 1/4 x4" is indeed "x5 + x3". You see? The "core" idea is not hard to understand. But I agree that specific exercises can be quite spicy. Remember the "chain" rule from note 5? the 'core' idea will suffice for the moment. 2. Integration over an interval "a ≤ x ≤ b": ∫ab f(x) dx. calculating the "area" below the function f(x) in two dimensions, like the XY plane. Would we do a similar action in three dimensions, then we would calculate the "volume" bounded by some surface. Later we will see more on the latter (not this note). Ofcourse, it can be proved in a formal way. However, I like to provide an illustrative example. Suppse we have the line f(x)=2x. So indeed. The integral returns the same value, as the Surface area we calculated before. Therefore, I hope that I made it "plausible" to be true in general as well. Please remember that the indefinite integral (without the boundaries "a" and "b"), returns primitive functions. And, the definite integral (over an interval) returns a value, to be intepreted as the Surface area below f(x). Determine the definite integral of f(x)=2x3 -5, in the interval 1 ≤ x ≤ 3.
since I need those too for note 10 (which is about differential equations).